Loving was about knowing when to shelter and when to set free. ‘Tis not stupidity to trust someone held within one’s heart. A man’s honor was the only thing of value he could call his own. My Thoughts: I’m partial to time travel. I mean, after all, what is better than experiencing the real thing instead of reading about it in history books? 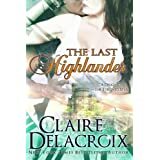 Author Claire DelaCroix made it very enjoyable plenty of comical situations and many moments where I related to the anguish of the main characters, eyes brimming with tears or laughing out loud to the reactions of the hero of the hour, Alasdair MacAuley. It is so much fun seeing the 20th century in the eyes of someone from centuries before. In this delicious read the past (one Alasdair MacAuley) ‘experiences’ the modern world. Morgan has come to Scotland with her sister Justine and her sister’s husband Blake. She’s hoping to give them some downtime, pull Blake out of his ultra organized way of approaching things and just maybe have them start a baby. She would never marry, not after the huge mistake she made with her first. She wanted to see Scotland, the real Scotland, listen to tales of the past, something to jumpstart an illustrated book about Scotland. Alasdair MacAuley takes a dare from a wee witch, ends up going through a portal heading seven centuries in the future. His world is full of tales of Morgaine Le Fee, so when the first person he meets is Morgan, he immediately knows he’s met the queen of the Fey in another realm. All he sees belongs to her world, so he doesn’t know anything more than he somehow ended in the land of the Fey. Alasdair is a hero in denial. He has lost his present and can’t grasp he’s in the future,-rather he holds to the idea of the sorceress, Morgaine Le Fee has turned his world upside down. With his moving into the future, he has changed the past. Robert the Bruce is no longer a hero, battles hadn’t been won. Alasdair never believed in love, the kind his gran’s tales spoke of, until he met Morgan. He also has a tongue of gold, melting Morgan’s hardened heart and having me out-and-out bawling. “Do not dismiss my tribute, my lady. You are like the rose, which blooms in beauty all the season long, though few appreciate the challenges it overcomes to bring those blossoms to light. ‘Tis a stalwart plant, a harbinger of fair weather, yet of sufficient strength. Morgan had a problem trusting men. Her first husband, she divorced ten years previous, left such a wound in her heart, it was deeply scarred. I really enjoyed the scene where Morgan and Alastair were in the back of a small car heading to the Highlands along with her sister and brother-in-law who was driving. Here’s the excerpt which had me laughing because I could truly relate (I’ve lived in countries where I’ve had to deal with the same, but thank heavens it wasn’t clockwise, but counter-clockwise). Having conquered not only the unfamiliarity of driving on the left side of the road and shifting gears with the left hand, a North American tourist might consider himself an accomplished UK driver. At least until he encountered the humbling experience of the roundabout. Supposedly, this alternative to traffic lights is intended to make driving from point A to point B less of an ordeal—but to the uninitiated, the reality is a nail-biting contradiction. The roundabout—as might be expected from its name—is a circular intersection, the converging roads radiating from the enter like spokes of a wheel. A given car enters at one spoke, merges with the traffic already on the roundabout, travels clockwise around the circle, then exists at the destined spoke to continue on its way. The equation is complicated by the structure of the roundabout itself. There are usually at least two lanes: the outer one for traffic exiting at the next outgoing road, the inner one for vehicles traveling further around. Incoming cars must take advantage of any break in the traffic and lunge into the appropriate lane. The scene that follows is truly hilarious as it takes Blake, Justine and Morgan to navigate the circle the circle in their chariot (so named by Alastair). “Right turn signal,” Justine murmured. She leaned forward in her seat, pulling off her dark eyeshields as she did so. An astonished stream of similar chariots sped across their path a breakneck speed. They looked like so many beetles and when Alasdair looked carefully, he could see people trapped within each one. They had the same dark shield over their eyes as his companions, making it look as though the insects had yet more insects in their bellies. He thought of his gran’s tales of Faeries riding the backs of moths and beetles. Blake inched their chariot forward, watching the stream avidly. Evidently they were going to enter this rush of shiny beetles. Alasdair was not certain he wanted to watch. “First gear,” Blake gritted out. “After the red one,” Morgaine declared, her nose fairly pressed against the curved window. Blake leaned forward, his knuckles white on the stick between himself and Justine. A red chariot not unlike their own flashed by. “GO!” the women roared simultaneously. The Micra squealed in protest, and Blake urged it forward. Alasdair’s eyes widened at the proximity of an extremely large vehicle that was closing in at great speed and he nearly squealed in sympathy. Instead, he crossed himself. It seemed rather a timely moment to find his long-misplaced religious beliefs. Need I say more about this wonderful read? It’s funny, at the same time the story will clench your heart. Will love win out in the end? This is a five-star review. I highly recommend Claire DelaCroix’s books, whether time travel, historical romance or fantasy. She will surely entertain! About the Author: NYT bestselling author Claire Delacroix always loved stories, both telling them and hearing them. She sold her first romance novel – THE ROMANCE OF THE ROSE – in 1992 and has published over fifty romance novels since. She writes in a variety of subgenres, including time travel romance, historical romance, medieval romance, fantasy romance and fantasy with romantic elements. She has also written under the names Claire Cross and Deborah Cooke. She makes her home with her family, a number of incomplete knitting projects and a lot of overgrown houseplants. Claire loves to travel, to cook, to ride her bike and to read. 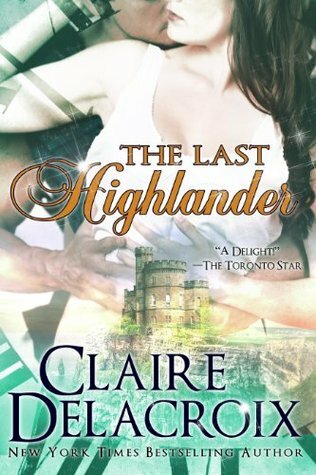 This entry was posted in Book Reviews, Medieval Romance, Romance, Time Travel and tagged Book Review, Claire Delacroix, Medieval Historical Romance, Scottish Time Travel, The Last Highlander. Bookmark the permalink. This sounds like a great read and I know all about roundabouts!! I failed my first driving test at a roundabout with 5 turn offs. Loved the review and it is one book I have not read yet, but I will have to correct that soon. Sound like a great read, but I would expect nothing less from the author, Ms. Delacroix is very skilled at weaving her tales. LOL at the roundabout scene, I never had problems with them but I see people all the time that blunder thru them or stop outright in indecision. It seems we’re all commenting on roundabouts. Was yours about roundabouts or have you read Claire Delacroix? Thank you for stopping by so often. I appreciate hearing from you. My experience with roundabouts was in Lebanon. Add to the mix people in Tripoli do not stop at stop signs, go the wrong way on one-way roads when convenient, triple park, mind you, not double park. I could go on and on. The roundabouts didn’t have 8 spokes, but it didn’t matter to the people. Oh, I didn’t mention there are no definite lanes in a roundabout. I eventually stopped driving over there, altogether! I did my renditions of Ave Marias, like Alastair, every time I took the car out. Thanks, Eniko, for commenting. I’ve read so many of this author’s works and her audios are sublime. She’s one of my favored authors for sure. Roundabouts can be quite scary depending on what country you’re in. In Blake’s case, he was driving in a country that drives on the opposite side of the street, does roundabouts clockwise versus counter clockwise. I could just feel the trepidation in the whole car! I am a member of her review team and read her historicals and time travel. Lucky you! You are sitting in the front row, ma’am! I fell in love with this writer with her audiobooks of The Jewels of Kinfairlie. Thanks for popping by. Oh man, roundabouts in the UK. LOL Being an American who has traveled around the UK, I can say it was frightful the first time around. You got used to it after awhile but the turn signal is still a complicated matter. It messes with your mind.